UPDATED: Megan Peterson, formerly of Middle River, Minn., says it's a weight off her shoulders to hear the Rev. Joseph Palanivel Jeyapaul was arrested Friday in India. He faces felony charges in Minnesota district court in Roseau, Minn., that he sexually assaulted Peterson in 2004 when she was 14 and another girl who was 16 in 2005. He's been a fugitive in India, working as a priest, since the charges were filed in Roseau in 2006. Megan Peterson was home with family near Middle River, Minn., on spring break from college this weekend when she heard that the fugitive priest who she says sexually assaulted her when she was 14 was arrested Friday in India. "I'm kind of in shock," said Peterson, 22, today as she drove back to Winona (Minn.) State University where she's majoring in studio art with a minor in child advocacy. "I just heard about it last night. It's a big weight off my shoulders and I'm glad he's away from kids and hopefully justice can be served." According to news sources in India, the Rev. Joseph Palanivel Jeyapaul, 57, was arrested Friday there on charges out of Roseau County that he sexually assaulted two girls in 2004 and 2005 while he was priest of Blessed Sacrament parish in Greenbush, Minn. He was scheduled to appear Sunday before a magistrate in New Delhi. 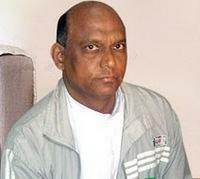 Interpol contacted Indian officials who issued a warrant for the priest's arrest Friday. Jeyapaul was a visiting priest from India who spent about a year in the Catholic Diocese of Crookston, in the Greenbush parish. He returned to India in late 2005, before criminal charges were filed against him in state district court in Roseau in 2006. He's been a fugitive since from justice here while still working as a priest there. Officials of the Catholic Diocese of Crookston said they cooperated with local prosecutors but that Jeyapaul fooled them when he left for India under false pretenses and never returned. However, Jeyapaul said former Bishop Victor Balke told him in 2006 to stay in India because of the criminal charges, according to a report from The Associated Press. But Balke, now retired in Moorhead, also warned church officials in India about Jeyapaul, according to church officials. Peterson says she was told Saturday night of the arrest by David Clohessy, head of SNAP, the Survivors Network of those Abused by Priests, with which she now works closely. She was 14 and had just started high school in Greenbush, in the fall of 2004, Peterson said. After school one day, she stopped in Blessed Sacrament to pray alone. Jeyapaul violently assaulted her sexually, threatening to kill her and her family if she told anyone. The abuse went on for some time. "I was raised very religious," Peterson said. "I was very religious myself. I was set that I was going to be a nun. I visited a convent once a summer for five years prior to that. This was my first year if high school and I was excited about that because the church was so close to the high school I would be able to go there to pray before and after school." Jeyapaul seemed to show her an evil face, at odds with her view of priests at the time. "He was very violent. We grew up with priests elevated above man. I had heard about this stuff happening but I thought it was just isolated. And the priest I had grown up with mostly, (the Rev. Don Braukmann, now in Bemidji) was just a fantastic man. When I first told authorities about the abuse, he drove to the high school and sat and talked with me." Even though Jeyapaul was a new priest in the parish, visiting from India where he was ordained in 1982, she saw him at first, too, as a man of God. "He didn't have to gain my trust, he already had it," she says of her childhood faith in the church and Jeyapaul. But that was shattered, as was much of her life, by the violent sexual attacks in the very church where she went to pray and worship, she says..
At one point several years after the abuse,she tried to take her own life, Peterson said. She lost the devout faith of her childhood. "I don't participate in the Catholic faith at all. I have nothing against it. I think faith is really important thing. I wish I still had it. But I'm just not at the point in my life where I could go back to an institution like that. I guess I'm spiritual, but I don't belong to any faith at all." She's still dealing with it, Peterson said. "It's affected almost every area of my life. My schooling, my relationships with people have suffered. I have PTSD with this. It's just been really hard and the loss of faith.... It was just a loss for me." Jeyapaul returned to India, telling officials of the Crookston diocese a relative was ill; he never returned. The Roseau County attorney's office filed sexual assault charges against Jeyapaul, involving Peterson, who was 14 and 15 when the attacks occurred, and a girl who was 16 when the prosecutor says Jeyapaul molested her. But Jeyapaul refused to return to face the charges and the prosecutor went though the complicated protocol of extraditing someone from India on such charges. That process included contacting Interpol, a Roseau county official told the Herald several years ago. Jeyapaul has spent much of his time in his native India since 2006 working as a priest. Bishop Victor Balke, now retired, had written Rome and church officials in India warning them about Jeyapaul. According to the Times of India, in April 2010 the Archbishop of Madras asked Jeyapaul to return to the United States to face the charges. Church officials there said he had been kept away from young people and supervised directly by his bishop. Last year, Peterson won a $750,000 civil lawsuit against the Crookston diocese which also included "non-monetary" elements, such as requiring better measures in place for church officials to deal with priests who commit misconduct and to help victims, Peterson said. Those measures include a notice posted on the diocese's website, www.crookston.org., that includes a photo of Jeyapaul and how to contact Roseau County officials about him. According to the diocese, the lawsuit brought by Peterson was over negligence in hiring Jeyapaul. Diocesan officials said early on they found Peterson's allegations credible. Jeyapaul came to the diocese in September 2004, spent time in Thief River Falls, then in the Greenbush parish and nearby Karlstad, Minn., according to the diocese. On Aug. 5, 2005, the diocese received a complaint about Jeyapaul behaving inappropriately with a girl and determined he had violated the diocese's sexual misconduct policy, according to the diocese's notice. On Sept. 15, 2005, the Crookston diocese revoked Jeyapaul's assignment to work there. But he already was in India, according to the diocese. In October 2006, the diocese learned of allegations from another girl that Jeyapaul had sexual contact with her. Jeyapaul in the past few years has denied the charges to news reporters and also said he was willing to return to the United States. Peterson hadn't been hopeful he would, she told reporters last year when news of her civil settlement with church officials was announced. She now works with SNAP and has talked with other victims of sexual abuse, Peterson said. She's also a party to a lawsuit against Pope Benedict XVI and three other prelates in Rome, brought by well-known St. Paul attorney, Jeff Anderson, alleging church officials helped keep Jeyapaul and other priests from facing justice for alleged abuse. The first person she told about the sexual attacks was the Crookston diocese's victim advocate, calling her when she was 15 and the attacks were ongoing..
"She hung up on me," Peterson said. "She didn't even get my name. I think she thought I was someone playing a joke or something." Later, after she told a friend, the information came to the Roseau County attorney who filed charges in 2006. Peterson said now she expects to work with the county attorney's office in Roseau as Jeyapaul is returned to Minnesota to face the criminal charges. "I have heard of other people (who were victims of Jeyapaul. ), she said. "I suspect there are way more."